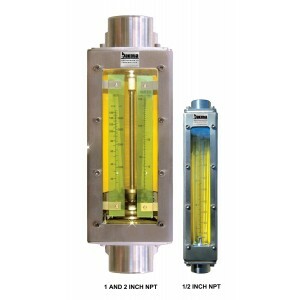 Heavy-duty flow meters are fully enclosed in a brushed stainless steel case. Ideal for industrial applications with flow rates of up to 116 GPM / 440 L/min and 250 SCFM / 7080 L/min. Used for flow measurements of liquids (water) and gases (air.) Meters are graduated for direct reading of water and air. Wetted parts include borosilicate glass flow tubes, Viton™ O-rings and 316 Stainless Steel fittings, guide rods and float stops. These flow meters come with FNPT end fittings.